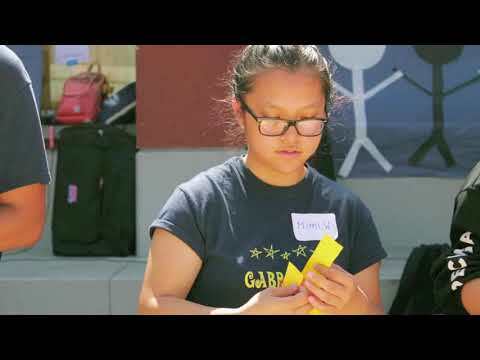 SAN GABRIEL, CA – Gabrielino High School students danced and sang along to a playlist of upbeat songs on Sept. 26 as they built and hung paper chains made of links featuring the names of students and something they had in common – a shared class, favorite food, or type of music. 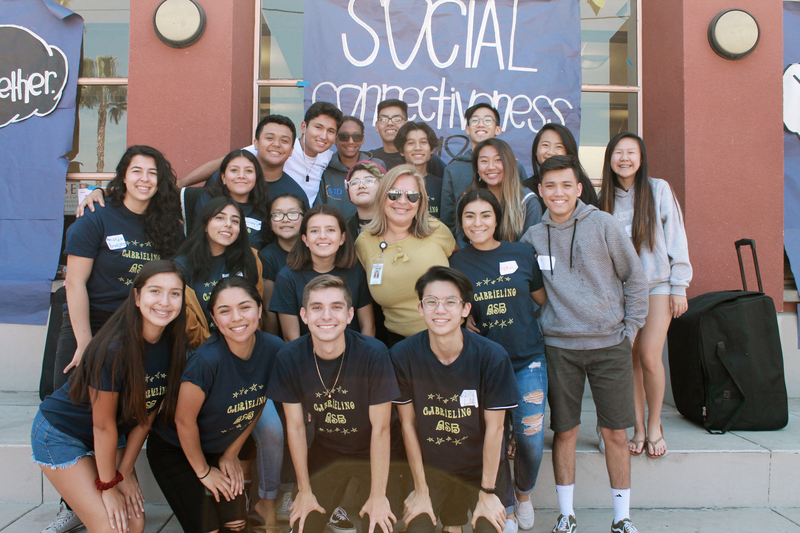 The chain-building activity culminated Gabrielino High School’s inaugural Mental Health Awareness Day, which brought students together to promote social connectedness and highlight issues like isolation. The event was the first of four Mental Health Wellness Days that Gabrielino will host in 2018-19 as part of a larger effort to boost mental health awareness and improve socioemotional support for its students. Earlier in the week, Gabrielino students paired in class with someone they did not know well and filled out a “link” for the paper chains. The goal was to help students find common ground with one another, build new friendships and ensure every student had the chance to participate in Mental Health Awareness Day activities. Mental Health Awareness Day was organized by Gabrielino’s Wellness Council in partnership with the school’s Associated Student Body, Peer Helping and Health Occupations Students of America (HOSA) clubs. The awareness days are one component of a three-part wellness action plan to improve student nutrition, physical activity and social/mental well-being. Throughout the week, HOSA club distributed its student mental health guide – “Clear Minds, Better Lives: A Guide to Mental Health” – that provides tips for destressing, highlights local mental health resources and lists apps and helplines for students in crisis. Peer Helping Club also distributed name tags to every student in an effort to help students get to know one another and establish a personal connection. Future Mental Health Awareness Days will focus on topics like anxiety and stress management, depression and body image. SANGAB_GABRIELINO_MH_AWARENESS1: Gabrielino High ASB Fundraiser Commissioner Mimi Wan builds a paper chain that highlights commonalities between their peers during the school’s inaugural Mental Health Awareness Day on Sept. 26. SANGAB_GABRIELINO_MH_AWARENESS2: Gabrielino High’s Associated Student Body officers pose under a poster promoting social connection during the school’s Mental Health Awareness Day, held Sept. 26. Gabrielino High’s Associated Student Body officers pose under a poster promoting social connection during the school’s Mental Health Awareness Day, held Sept. 26. 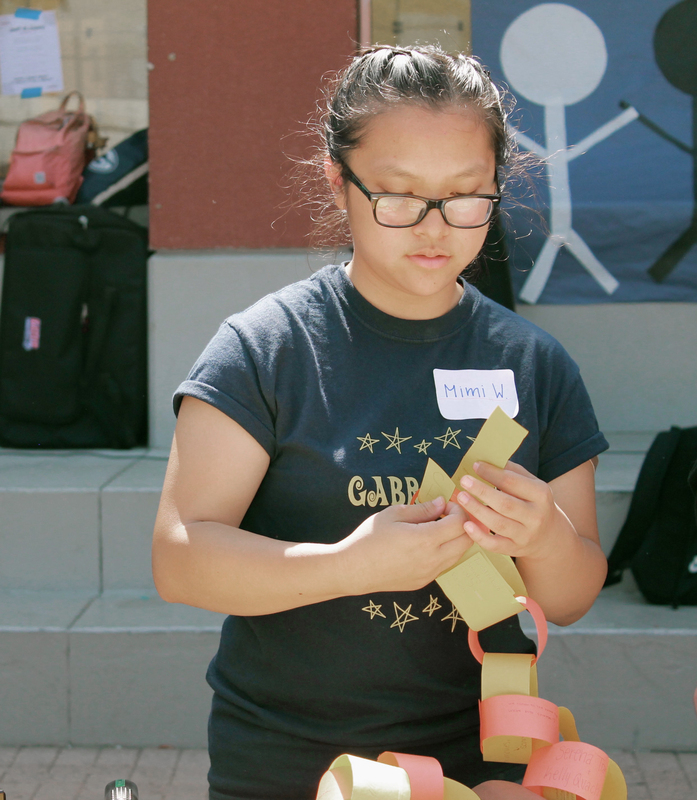 Gabrielino High ASB Fundraiser Commissioner Mimi Wan builds a paper chain that highlights commonalities between their peers during the school’s inaugural Mental Health Awareness Day on Sept. 26.